This local man has a monumental show set to happen this week at Decibel Festival. What is it you ask? WELL, It’s called Community Bass Session and it will be a memorable time for all who attend. Come support my buddy WD4D and the beat masters listed above..
DD: Whatsup mannn, great job playing at the EMP for Bumbershoot. Working your all live set! You’re playing twice at this year’s Decibel Festival, how will your sets look? Thanks a lot! I’m fortunate to have tested out the live set at Bumbershoot. 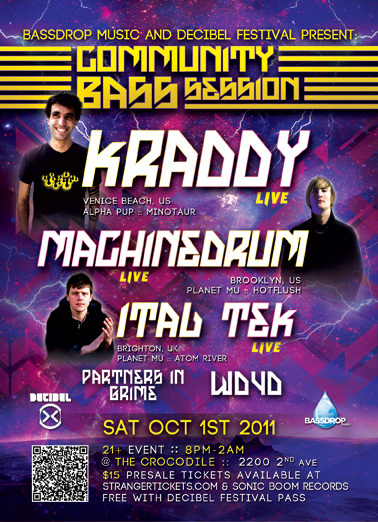 I’m planning on performing the latest, updated, improvised version of that for the Community Bass Session w/ Kraddy, Machinedrum, Ital Tek, & Parters in Grime (Sat, Oct.1st / Crocodile Cafe). The following evening will be an eclectic dj set for the dBridge show at Baltic Room w/ Kid Hops & Quadrant, myself, & Introcut. DD: For someone who is unsure about attending the festival, or isn’t too aware of electronic music, how would you encourage them to check out Decibel Festival? I’d definitely recommend dB in the Park, as that’s what really solidified it for me a few years ago. It was just a really good feeling to be there with so many like minded folks in broad daylight, freaking out to some of the most advanced sounds I’d ever heard. Also, that one’s free, so kind of a no brainer there. Other than that, I’d just recommend looking for some names you might recognize & checking out their showcases. Take a friend’s or a blog’s recommendation if you’re not familiar… Feel it out. Definitely check out the workshops during the day too. That stuff is pure GOLD!!! Learning the tricks of the trade from the artists who are performing later that night… PRICELESS!!! Just do as much as you can & you should be free of any regret later. That’s pretty much it! Just want to thank everybody who’s put in work over the years to make dB fest what it is. It has become something amazing that draws people from all walks of life, from all over the world, to come & celebrate, learn, & look forward to the future. BEAUTIFUL!